When I was on holiday in Turkey, I managed to find a yarn shop. My OH muttered something about me being able to find yarn in a jungle and wandered off to buy a drink. The shop was down a back street and I could smell the acrylic fibres from 20 paces (I think that is how I found it). It was a very cheap yarn shop. But I was not to be deterred, I knew there must be a hidden gem in amongst the static. There was indeed some very nice cotton yarn, in some lovely bold colours but these were the ones that caught my eye. The yarn is Alize Bahar and it is a sport weight yarn. I bought three balls of each colour and it cost the grand total of 10 Turkish Lira which roughly translates to £4.40 for 600g of cotton! I told you it was a cheap shop. It's really soft and smooth cotton and the colours made me think of Turkey, which is why I chose them. We were staying in Antalya which is a coastal city surrounded by mountains. Everywhere you look, there are blues and greens, both close at hand and in the distance. The above photo was taken on a very short boat trip out of the Marina looking at Antalya from the sea. When the sun is out, the view is stunning. So you can see why I was inspired by the colours even, if I wouldn't normally go for this kind of yarn. I normally find self striping yarn limits the type of project you can make and to be honest I wouldn't be seen dead in the cardigan on the ball band. It may be all the rage in Turkey, but it isn't my cup of tea at all. None the less I itched to own this yarn, especially when I found out how much it cost. So with lots of pointing on the part of myself and the vendor, I managed to buy my yarn and when I next sat by the pool I decided to play with it. As I had with me the grand total of one set of knitting needles and a crochet hook, for picking up dropped stitches, my playing was rather limited. After half an hour I gave up and decided to wait until I got near a stitch dictionary, but I had decided that crochet would be my craft of choice. Anyway to the hexes alluded to above - I'm a little bit obsessed with them at the moment. I think it is the fault of lots of bloggers out there who are inundating me with hexagons in all shapes and forms. Firstly there was Bitter Purl's Half Hex Quilt in all it's linen loveliness. I also love Tintocktap's Hexagon blanket, and of course the colourful glory that is Attic24's Hexagons. I had these ideas and more floating around in my head without even realising until I bought this yarn. This yarn made me think I could make nice granny type hexagons with different colours in, but without having to change the yarn! 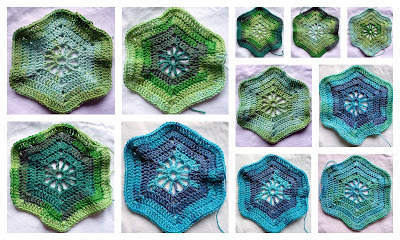 I played around with a couple of patterns until I settled on one for a Wheel Hexagon from The Encyclopedia of Crochet Techniques by Jan Eaton. This is the book that I learneed to crochet from. It is a great book full of clear directions and pictures. I has both written instructions and diagrams, so that you can learn both methods of pattern reading. I chose the Wheel Hexagon because it has a nice open centre, but quite solid edges. This gives the colours a chance to shine and still keep the finished item light and airy. To add to the airy quality of this project, I went up a hook size or two from the one recommended to 4mm. The hexagons produced are soft and drape beautifully. This is what I have from two days hooking. Do you like my nifty collage? I've only just learnt how to do that! I think the two colourways will blend really well and will look like there are many more involved than actually are. I sort of laid them out to see how it would look and this is one of the options. I'm getting around 6 hexagons per ball of yarn, so I plan to make a wrap with my Turkish Hexes. Only when I have all of them complete will I be able to make a call on how they will be placed. They may be random, or I may group darker colours together at the ends, I don't know. I will all depend on how the yarn unravels. Until they are all done, I will enjoy the piles of drapey hexagons that make me think of lily pads. Hexagons are a great way to get back into the swing of crafting after a week in the sun. I highly recommend it.